brandflakesforbreakfast: what's round, white and carries 3 million bacteria? what's round, white and carries 3 million bacteria? Love beer pong? Yea, us too. As much fun as it can be, however, have you ever stopped to consider how many germs you're ingesting by playing, especially if it's outside? Here's a fun party fact: 3 MILLION bacteria can live on the ball! 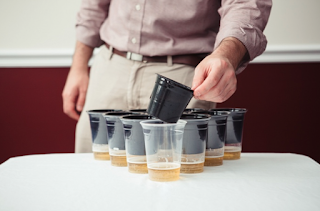 No fear, there's a satisfactory solution that will keep your favorite drinking game in tact - Sip Cup is an insert that fits snuggly in Red Solo Cups. The inserts allow for beer to sit at the bottom without the ball actually touching the liquid. Simple, but BRILLIANT. So now riddle us this: do you really think frat boys are counting the germs on the ping pong balls? Things that make you go, hmmmmmmmm.